I’m going to get this over with right away and tell you: Elementary is nothing like Sherlock. Yes, they are both based on the Sherlock Holmes stories by Sir Arthur Conan Doyle (who actually kind of hated those stories). And, yes, they are both set in the present day. But, really, that’s it. Okay, Sherlockians. You can go now. To the rest of you, I have this to say. Elementary is a cute fun little show. It’s not particularly epic, it’s very procedural, and it’s a good fit for CBS. A nice fun show with a crazy genius solving mysteries while his eye-rolling carer chases after him and puts in her two cents. It’s not all that different from most of the procedurals out there, but it does a good job and it’s reasonably enjoyable. What’s really most unique about the story is the fundamental setup. In this version, Watson is the main character. This may not seem earth-shattering at first glance, but when you think about it, it really is. 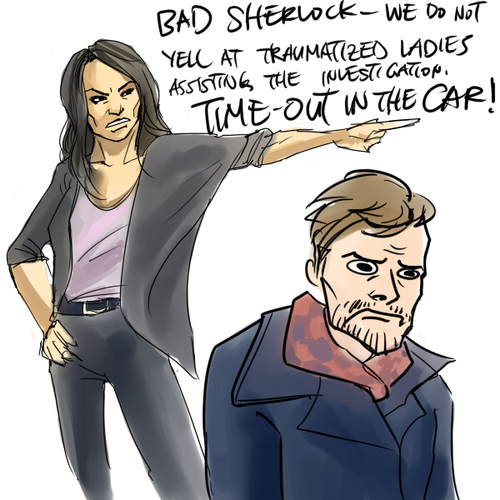 Most Sherlock adaptations put a lens on Watson, since he’s generally the relatable one of the pair. But few of them actually make Watson the protagonist, where it’s his (or her) emotional journey and transformation. This one does. Which, frankly, is the best thing it can do. In this version of the age-old story, Joan Watson is a former surgeon, now medical companion, whose job is to follow around junkies and alcoholics, making sure they don’t backslide. She follows them to work and out at night, takes random drug tests, and lives in their houses. It’s her job, and she hates it. Sherlock Holmes is her latest case. An addict who’s just escaped from rehab, he’s positive he won’t backslide again, and thinks she should really just buzz off. He’s impulsive, emotional, prone to tantrums that would rival any toddler, and incredibly nosy. Joan can’t stand him. She does, though, really like the work he does. Since Sherlock is a consultant with NYPD, contingent on his staying sober, Joan gets to accompany him to crime scenes and as he interrogates (bullies) witnesses. She gets to contribute to the cases, use her human touch to get them further than Sherlock could, and helps solve murders. She likes it. It is, honestly, hard to write about Elementary without automatically defaulting to comparing it to Sherlock. Really, though, the two shows are quite different. For one thing, the interpretations of the characters in this show are new. Joan is a tightly wound New Yorker, who isn’t all that interested in accessing her softer side. Sherlock is a bundle of emotions and contradictions, and his pleasure at besting Joan is undercut when he apologizes for hurting her. The show itself is much smaller and less bombastic than its British cousin, and really feels quite like a normal buddy cop drama. But, like I said, this show really gives Joan the forefront, and I think that’s for the best. Look, Sherlock Holmes is a genius. He’s a genius in every incarnation of the show. He’s always clever, always outwitting everyone. He might go through varying degrees of physicality or sexual attractiveness, but at this point we know Sherlock very well. He’s Robert Downey Jr., Benedict Cumberbatch, Jeremy Brett, Christopher Lee, Basil Rathbone and Hugh Laurie. And also this bloody great list of names here. We know Holmes. Really, really well. To be honest, though, we don’t know Watson nearly as well. In some of the original stories, Watson is a quick-witted accomplice, following right behind Holmes and helping solve the case. In others, he’s a dim-witted patsy, just there so that Holmes can be clever in front of an audience. And in still others, he’s a gallivanting ladies man who can’t keep his love on just one continent. And sometimes he’s all three. With all these interpretations, then, it’s a bit sad that there hasn’t really been a series that focused on Watson’s feelings. If Sherlock is the brains of the operation, then John is certainly the heart, and it’s nice to finally see that heart beat. There’s also a lot more wiggle room with the Watson character. For Holmes, there are rules that must be followed. Must always be clever. Must always be quick. Should have a strong right hook. Likes drugs. Easily bored. Etc. Watson, on the other hand, is more of a mystery. Must be a doctor. Must follow Holmes. Doesn’t necessarily have to think Holmes is brilliant. Doesn’t really need to get married, or not get married, or be in the army, or like sweaters more than suit jackets. Watson is whomever the writer chooses to make him. And, as I said before, Joan is a pretty cool character because of that. For starters, I like the fact that they’ve managed to change her gender without changing the character or the fundamental relationship with Holmes. As you can see here, I was quite worried about that. Genderswapping leaves the door open for a lot of sketchiness in power dynamics, so it was nice to see that the writers anticipated that and fought against it. Joan is Sherlock’s carer, and is automatically in a position of authority over him. When they go to crime scenes, she defers to him. But it’s not subservient and it’s unrelated to their genders. They have a remarkably stable relationship. For all of the departures, though, it’s nice to see the places where Watson has stayed fundamentally the same. It’s this combined with the new touches that make Joan Watson an intriguing character. She still cares deeply about people, even if she doesn’t want to show it. Still a fan of blokey things like baseball and running, but also loves the opera and high culture. Not a morning person. All of this pales in comparison, though, with the monumental joy I get when I realize that not only did CBS make a Sherlock Holmes show that is quite good and original and has a woman in it, they also made that woman the main character. It satisfies my desire to see strong female characters leading shows and creating new media conversations and ideals, and it makes me happy because Lucy Liu is fabulous and well suited. But most of all, I appreciate the decision to give Watson the spotlight for once. Like I said, we know Sherlock Holmes. Getting to know Joan Watson will be a new and thrilling adventure. Is the other one Naoko Mori or Keiko Agena?